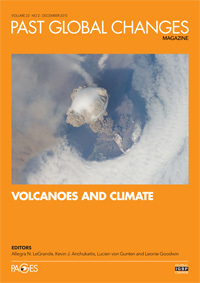 This issue of Past Global Changes Magazine: Volcanoes and Climate highlights how volcanic eruptions represent some of the most climatically important and societally disruptive short-term events in human history. It focuses on the history, processes, and consequences of large eruptions and how they affect the climate system. M. Sigl, J.R. McConnell, M. Toohey, G. Plunkett, F. Ludlow, M. Winstrup et al. O.V. Churakova (Sidorova), M. Saurer, R.T.W. Siegwolf, M.V. Bryukhanova et al.